Coal use may soon exceed a 2013 worldwide peak if current growth continues, warn researchers, putting the world on track for 3°C global warming. Global carbon emissions are set to hit an all-time high in 2018, researchers at the UK's University of East Anglia (UEA) and the Global Carbon Project (GCP) announced December 5. The 2018 increase is projected at 2.7%, within a range of +1.8% to +3.7%, after increasing by 1.6% in 2017, with little-to-no growth from 2014 to 2016. The International Energy Agency (IEA) forecast December 4 that global emissions would increase by 3.7% in 2018. The new UEA/GCP data, published simultaneously in Nature and other scientific journals, reveal that world emissions from burning fossil fuels are expected to reach 37.1bn metric tons CO2 in 2018. This year's rise is driven by a "solid growth in coal use for the second year in a row, and sustained growth in oil and gas use," said UEA researchers, describing it as "further call to action" for governments at the UN’s COP-24 in Katowice this week. Coal use may soon exceed a 2013 worldwide peak if current growth continues, they added, while oil use is growing strongly in most regions, and gas use grew almost unabated in recent years. The 10 biggest emitters in 2018 are China, the US, India, Russia, Japan, Germany, Iran, Saudi Arabia, South Korea, and Canada. The EU, as a whole region of countries, ranks third. Corinne Le Quere, UEA professor of climate change science research, said that: "To limit global warming to the Paris Agreement goal of 1.5°C, CO2 emissions would need to decline by 50% by 2030 and reach net zero by around 2050. We are a long way from this… because if countries stick to the commitments they have already made, we are on track to see 3°C global warming...We need strong policy and economic support for rapid deployment of low carbon technologies to cut emissions across the energy and transport sectors, from buildings and from industry." China’s emissions account for 27% of the world’s total, having grown an estimated 4.7% in 2018 to a new all-time high. Renewable energy is growing by 25% per year but from a low base. US emissions account for 15% of the global total and are estimated to have grown by 2.5% in 2018. The EU’s account for 10% and declined by 0.7% - well below the 2% declines seen in the decade to 2014. India’s are 7% of the world total, and grew by 6.3% this year as the economy boomed. The five countries contributing most to the rest-of-the-world growth in global emissions in the last decade are Saudi Arabia, Iran, Turkey, Iraq and South Korea. The meagre good news amid the gloom is that 19 countries reduced their emissions in over the 2008-17 decade whilst their economies grew: Aruba, Barbados, the Czech Republic, Denmark, France, Greenland, Iceland, Ireland, Malta, Netherlands, Romania, Slovakia, Slovenia, Sweden, Switzerland, Trinidad and Tobago, the UK, the US, and Uzbekistan. The IEA had said December 4 that coal-to-gas switching, especially in the US and UK, helped reduce energy-related emissions in advanced economies over the past five years. 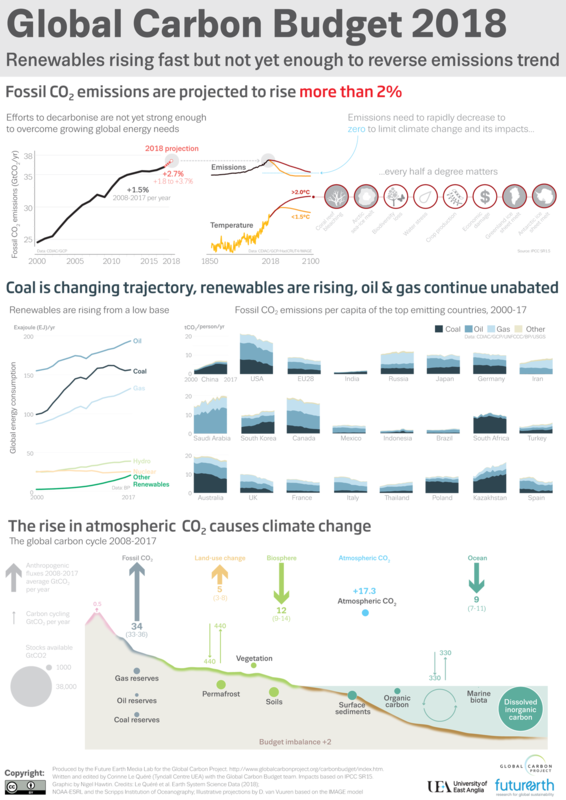 A link to the researchers' infographic is available here.